about freebairn | hello, just trying to heal, here! My name is Carol, and life took a turn that I’ve never quite bounced back from in 1992. I put considerable effort into moving past the relinquishing of my son in a private, semi-open adoption before finally surrendering to the fact that, at least for now, there is no moving on from it. I have not yet reunited with my son, but my hope has always been high that I will. I know I can’t go back and help the girl making that choice to see another way, and I can’t erase the effects it has had on my life. I can only hope that if my decision has had any harmful effects on my son, the damage is minimal. Something in me recoiled at the traditional route. Mine was a slightly more merciful process. There were 2 attorneys involved, one representing me and one representing the adoptive parents. Neither attorney specialized in adoption; it wasn’t even close to their chosen practices. All my life I’d heard about women whose babies were snatched away at birth, never to be seen or heard from again. They didn’t know if their children were alive or dead. I was always horrified at the thought of that and was determined to not let that be my story. I kept my baby with me for 5 days. 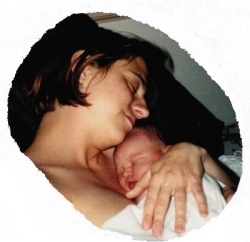 For 5 glorious days, I was my baby’s mother. Not knowing how the hospital would treat the situation – i.e., I didn’t know if they would separate me from my child out of fear I would freak out or whatever – I also stated that part of the terms and conditions of my relinquishment would be a home birth with a midwife. Their agreement to that was to have a medical backup plan in place in case complications arose. Much to my ongoing grief, I kept my word. I gave up my baby and my parental rights. Thankfully, the adoptive parents kept their word as well. Shortly after relinquishing, I began to run across women who’d given up their children who were promised pictures and letters, but, after a while, the letters stopped coming, and that mother was left in the same horrifying position I was so terrified of: her child was never to be seen or heard of again. Every year, around my son’s birthday, I held my breath, and every year for 18 years, I breathed a sigh of relief when the promised package with pictures and update letters arrived. I never wanted it to be in the atmosphere that giving my child up was about shame or hiding something, so whenever I was asked if I had children, I would always answer that I did have one child – and usually added that I’d given that child up for adoption. As a rule, I’ve found that people don’t really know how to react to that. And I have come to accept there is just cause for pause. There is something very unnatural, and unsettling, and inhumane about it all. There had to be another way…I just couldn’t see it at the time. There are lifelong consequences for a choice like the one I made. I have accepted that, but what I now refuse to accept is that the way things have been done in adoption is the way things should remain. Adoption loss, in so many cases, is an unnecessary and totally avoidable loss. At different times throughout my life, writing has helped me process things that are too difficult to otherwise process. The purpose of this blog is to try and make sense of it all and hopefully to help and share with others grappling with adoption past, present, or future and what it all means, collecting our thoughts and ideas to bring about change for future generations. All are welcome to join in the conversation. I also know that pain, the pain that has to be processed, that the love you felt for your son will never never be reciprocated. I know I have to let go; I had a postive reunion with my son when he was 24 but the need to hold on to him was so unexpected and overwhelming! Being a birth mother is truly demoralizing. No matter how positive and supportive your son is, you still feel the wound. He was adopted by 2 psychologists and had a life with so many advantages that I could never provide. Unfortunately his wife feels I’m a loser. Her mother did not give her up for adoption when she became pregnant at 17-(she had an older sister’s support; I had none) I think she is influencing him which really hurts. I only want the best for him. This was traumatic for you. You might have PTSD. Perhaps seeing a specialist in this field might help you process this. I am sure you will have a sucessful reunion with your son when he desires and needs it. I believe the connection is always there. Sometimes adoptees feel disloyal to their adoptive parents and have to work this out for themselves. (usually early 20’s) Do not despair. I am sure it will all work out. I too experienced a very painful loss after choosing an open adoption for my daughter at 14 years old. I never dealt with it and never wanted to deal with it, it hurt too much. The fact that I chose not to deal with my feelings led me down a very hard road in life riddled with drug abuse and neglecting the child I had now. BUT GOD!! He kept on chasing after me and finally I let Him catch me. He was chasing me so hard because He had something for me, my daughter that I was sure would hate me forever and wonder why I didn’t love her enough to keep her, she wanted to meet me, and everyone else in her family!!! Stay strong, keep the faith, God is weaving your story together in ways you cannot imagine, so just know that one day your sweet child will want to meet you and you will have the chance you deserve to tell her how much you love her and how hard it was for you to make the choice you did. I am praying over you as I type, that God would send you some hope!! And remind you that you made the best choice you could have made, you gave that child life and God will honor that!! Please contact me if you need to talk. My name is Maggie Flanagan and you can find me on Facebook, Pinterest, and Twitter.